This article is about the terrorist organization. For the military conflict, see Black September. The Black September Organization (BSO) (Arabic: منظمة أيلول الأسود‎, Munaẓẓamat Aylūl al-aswad) was a Palestinian terrorist organization founded in 1970. It was responsible for the assassination of the Jordanian Prime Minister Wasfi Tal, and the Munich massacre, in which eleven Israeli athletes and officials were kidnapped and killed, as well a West German policeman losing his life, during the 1972 Summer Olympics in Munich, their most publicized event. These events led to the creation or specialization of permanent counter-terrorism forces in many European countries. The group's name is derived from the Black September conflict which began on 16 September 1970, when King Hussein of Jordan declared military rule in response to fedayeen attempting to seize his kingdom — resulting in the deaths and expulsion of thousands of Palestinians fighters from Jordan. The BSO began as a small cell of Fatah men determined to take revenge upon King Hussein and the Jordanian Armed Forces. Recruits from the PFLP, as-Sa'iqa, and other groups also joined. Initially, most of its members were dissidents within Fatah who had been close to Abu Ali Iyad, the commander of Fatah forces in northern Jordan who continued to fight the Jordanian Army after the PLO leadership withdrew. He was killed, allegedly through execution, by Jordanian forces on 23 July 1971. It was alleged by them that the Jordanian Prime Minister at the time, Wasfi Tal, was personally responsible for his torture and death. There is disagreement among historians, journalists, and primary sources about the nature of the BSO and the extent to which it was controlled by Fatah, the Palestine Liberation Organization (PLO) faction controlled at the time by Yasser Arafat. In his book Stateless, Salah Khalaf (Abu Iyad), Arafat's chief of security and a founding member of Fatah, wrote that: "Black September was not a terrorist organization, but was rather an auxiliary unit of the resistance movement, at a time when the latter was unable to fully realize its military and political potential. The members of the organization always denied any ties between their organization and Fatah or the PLO." The denial described in Abu Iyad's claim was mutual: according to a 1972 article in the Jordanian newspaper Al-Dustur, Mohammed Daoud Oudeh, also known as Abu Daoud, a BSO operative and former senior PLO member, told Jordanian police: "There is no such organization as Black September. Fatah announces its own operations under this name so that Fatah will not appear as the direct executor of the operation." A March 1973 document released in 1981 by the U.S. State Department seemed to confirm that Fatah was Black September's parent organization. According to American journalist John K. Cooley, the BSO represented a "total break with the old operational and organizational methods of the fedayeen. Its members operated in air-tight cells of four or more men and women. Each cell's members were kept purposely ignorant of other cells. Leadership was exercised from outside by intermediaries and 'cut-offs' [sic]", though there was no centralized leadership. Cooley writes that many of the cells in Europe and around the world were made up of Palestinians and other Arabs who had lived in their countries of residence as students, teachers, businessmen, and diplomats for many years. Operating without a central leadership (see Leaderless resistance), it was a "true collegial direction". The cell structure and the need-to-know operational philosophy protected the operatives by ensuring that the apprehension or surveillance of one cell would not affect the others. The structure offered plausible deniability to the Fatah leadership, which was careful to distance itself from Black September operations. Fatah needed Black September, according to historian Benny Morris. He writes that there was a "problem of internal PLO or Fatah cohesion, with extremists constantly demanding greater militancy. The moderates apparently acquiesced in the creation of Black September in order to survive". As a result of pressure from militants, writes Morris, a Fatah congress in Damascus in August–September 1971 agreed to establish Black September. The new organization was based on Fatah's existing special intelligence and security apparatus, and on the PLO offices and representatives in various European capitals, and from very early on, there was cooperation between Black September and the PFLP. The PLO closed Black September down in September 1973, on the anniversary it was created by the "political calculation that no more good would come of terrorism abroad" according to Morris. In 1974 Arafat ordered the PLO to withdraw from acts of violence outside the West Bank, the Gaza Strip and Israel. The group was responsible for the murder of 11 Israeli Olympic athletes, nine of whom were first taken hostage, and the killing of a German police officer, during the 1972 Summer Olympics in Munich. Black September's official name for their action was "Ikrit and Biram", after the names of two Palestinian Christian villages whose residents had been expelled by the Israeli military Haganah in 1948. Following the attack, the Israeli government, headed by Prime Minister Golda Meir, ordered Mossad to assassinate those known to have been involved, in an operation codenamed Operation Bayonet. By 1979, during what became known as Operation Wrath of God, at least one Mossad unit had assassinated eight PLO members. 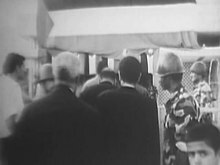 Among them was the leading figure of Ali Hassan Salameh, nicknamed the "Red Prince", the wealthy, flamboyant son of an upper-class family, and commander of Force 17, Yasser Arafat's personal security squad. Salameh was behind the 1972 hijacking of Sabena Flight 572 from Vienna to Lod. He was killed by a car bomb in Beirut on 22 January 1979. In Operation Spring of Youth, in April 1973, Israeli commandos killed three senior members of Black September in Beirut. In July 1973, in what became known as the Lillehammer affair, six Israeli operatives were arrested in Norway for the murder of Ahmed Bouchiki, an innocent Moroccan waiter who was mistaken for Ali Hassan Salameh. Recent remarks by Abu Daoud, the alleged mastermind of the Munich kidnappings, deny that any of the Palestinians assassinated by Mossad had any relation to the Munich operation, despite the fact that the list includes two of the three surviving members of the kidnap squad arrested at the airport. 8 May 1972: hijacking of a Belgian aircraft, Sabena Flight 572, flying from Vienna to Lod. September and October 1972: dozens of letter bombs were sent from Amsterdam to Israeli diplomatic posts around the world, killing Israeli Agricultural Counsellor Ami Shachori in Britain. 1 March 1973: Attack on the Saudi Embassy in Khartoum, Sudan: 10 hostages were held at the Saudi Arabian embassy, five of them diplomats. The US ambassador, the US deputy ambassador, and the Belgian chargé d'affaires were murdered. The remaining hostages were released. A 1973 United States Department of State document, declassified in 2006, concluded: "The Khartoum operation was planned and carried out with the full knowledge and personal approval of Yasser Arafat." 5 August 1973: two Palestinian militants claiming affiliation with Black September open fire on a passenger lounge in Athens now closed Ellinikon International Airport, killing three and wounding 55. A Lufthansa Boeing 737 is hijacked from Rome in December 1973 to demand that the gunmen be freed from Greek custody. Eight bombs were addressed to embassy staffers. Four were intercepted at a post office sorting room in Earls Court, but the other four letters made it to the embassy. Three of the letters were detected in the consulate post room  but Shachori opened his, believing it contained Dutch flower seeds he had ordered. The resulting blast tore a hole in the desk and fatally wounded Shachori in the stomach and chest. In Shachori's memory an annual memorial lecture on agriculture in London was established. Black Sunday - 1977 John Frankenheimer film about a fictional Black September plot against the United States using the Goodyear Blimp fitted with a bomb to kill 80,000 people during the Super Bowl, based on the Thomas Harris novel of the same name. ^ Pierre Tristam. "Black September". About. Retrieved 16 December 2014. ^ Quandt, Jabber and Lesch, p. 141. ^ Amos, 1980, p. 222. ^ "U.S. State Department Documents PLO-Black September Link (March 1973) - Jewish Virtual Library". Retrieved 16 December 2014. ^ Sylas, Eluma Ikemefuma (2007). Terrorism: A Global Scourge. United States: Author House. ISBN 978-1-4259-0530-9. ^ Shalev, Noam (24 January 2006). "BBC NEWS - Programmes - This World - The hunt for Black September". BBC News. Retrieved 16 December 2014. ^ الموساد قلعة التجسس الإسرائيلية [Mossad the Israeli spying citadel] (in Arabic). Aljazeera. 9 April 2010. Retrieved 4 July 2010. ^ "Background & Overview: Munich Olympic Massacre - Jewish Virtual Library". Retrieved 16 December 2014. ^ RAND Corporation (3 April 2001). "TKB Incident Page: Other Group attacked Airports & Airlines target (December 17, 1973, Italy)". MIPT Terrorism Knowledge Base. Oklahoma City, Oklahoma: Memorial Institute for the Prevention of Terrorism. Archived from the original on 30 September 2007. Retrieved 11 February 2015. ^ a b "BBC ON THIS DAY - 19 - 1972: Parcel bomb attack on Israeli embassy". BBC News. 19 September 1972. Retrieved 16 December 2014. ^ "TERRORISM: And Now, Mail-a-Death". TIME.com. 2 October 1972. Retrieved 16 December 2014. ^ "All Day Science". Archived from the original on 29 April 2012. Retrieved 16 December 2014. Morris, B.: Righteous Victims: A History of the Zionist-Arab Conflict, 1881–2001. Vintage Books, 2001. Katz, Samuel M.: Soldier Spies - Israeli Military Intelligence, Presidio Press, Novato, CA, 1992, ISBN 0-89141-357-X.